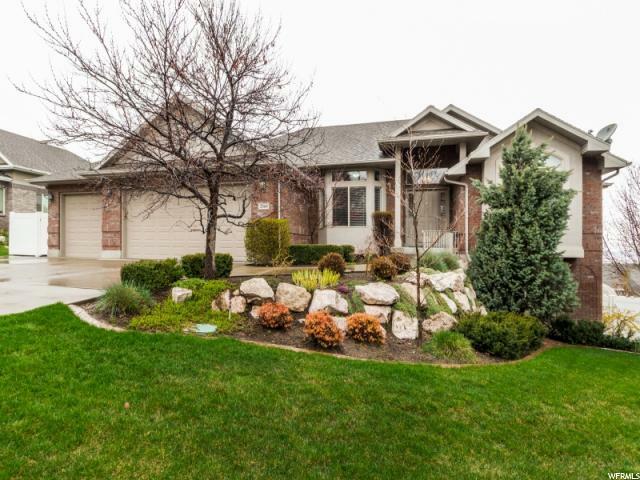 All Bountiful homes currently listed for sale in Bountiful as of 04/22/2019 are shown below. You can change the search criteria at any time by pressing the 'Change Search' button below. If you have any questions or you would like more information about any Bountiful homes for sale or other Bountiful real estate, please contact us and one of our knowledgeable Bountiful REALTORS® would be pleased to assist you. 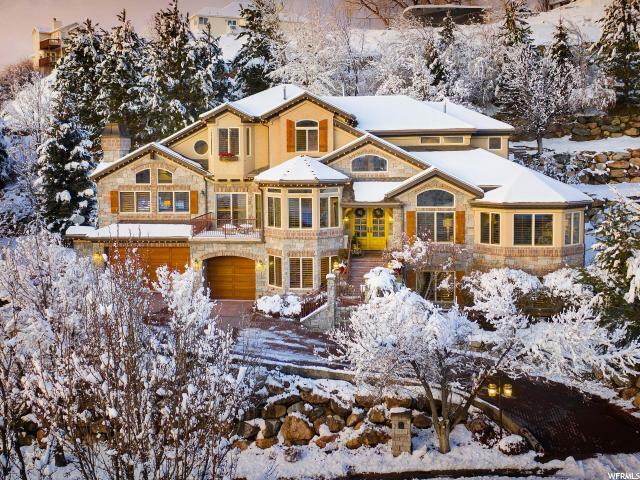 "Magnificent Chateau with panoramic views of the Great Salt Lake and mountain landscape. This residence has a tumbled stone facade, slate roof, cooper accents, porte cochere and 5-bay stone motor court. The grand foyer's sweeping double staircase, hand carved Italian limestone archways and French limestone floors showcase the exquisite materials found throughout the home. The formal living and dining rooms are perfect for intimate or grand gatherings. The chef's kitchen is equipped with professional grade appliances and is accompanied by a butler's pantry, kitchen office and separate food storage room. This entertainers paradise has a walk-out lower level family room with a second kitchen, indoor basketball court, bowling lane, exercise room, playroom and media room. Other features include smart technology, Lutron light system, in-floor radiant heat, generator and an elevator. The 13.62-acre grounds include an expansive flat lawn area with trails that extend up the mountainside." "Click on Tour to enjoy the videos, photos and 3D Tour. Here's a list of details. Crestron Automation System controlling light, AV and climate; automated blinds in great room & dining room that rise and lower based on light. Two outdoor fireplaces, five indoor fireplaces, cabana & sauna, steam in two showers, bowling lane, outdoor kitchen, racquetball court, entry way chandeliers with hydraulic lifts which lower to allow for easy cleaning, Main kitchen set up for catering with two ovens, two dishwashers and warming oven, Top of the line appliances, pet shower, tennis court with covered viewing patio, indoor/outdoor water pond and fountain, theater, infinity edge pool with electric cover, unfinished shower/locker room below tennis court, pool maintenance room below house with recently replaced pool heater, designer lighting which accentuates the house inside and out, huge master closet with attached laundry and walk-in safe, three wet bars (one on each floor), property borders National Forest with abundant wildlife (deer, turkeys, bobcats, coyotes and moose), heated garage, commercial grade water filter, water softener, custom woodwork throughout, grade A Brazilian cherry floors, grade level access to all three floors, custom designed porte cochere, security gate at each end of circular driveway, 4000 square foot garage with room for 6+ cars, Asian dragons on doorstep and Asian marble lantern in backyard stay with the house, hidden TV above fireplace in great room, hidden TV in master bathroom mirror, radiant heated floors." "Nestled in Stone Ridge Hollow this custom home sits on two building lots secluded with trees* Cobblestone driveway* Open gourmet kitchen* Dacor appliances* Huge great room with a 2-story vault* Tounge & Groove ceiling in private office* Built-in Cabinetry* Whole home audio* Hickory floors* Master suite with fireplace and en-suite bathroom* Deep jetted soaker tub* Large euro-glass shower equipped with body sprayers and rain shower head* Large bedrooms with Jack & Jill bath* Upstairs bonus room designed and reinforced for weight room* Spacious deck for entertaining with fabulous views of the lake* Main level laundry with custom cabinetry and sink* 8 car garage with custom Harley flooring and cabinetry* Plenty of space for gathering in downstairs family room* Second kitchen* Daylight windows in basement* Stadium seating theater with custom rear projection screen* High-end theater equipment* Basement walks out to a covered patio with hot tub* 5 acres of trees* Basketball court with lighting* Bartile Lifetime Roof* Many more extras!! " 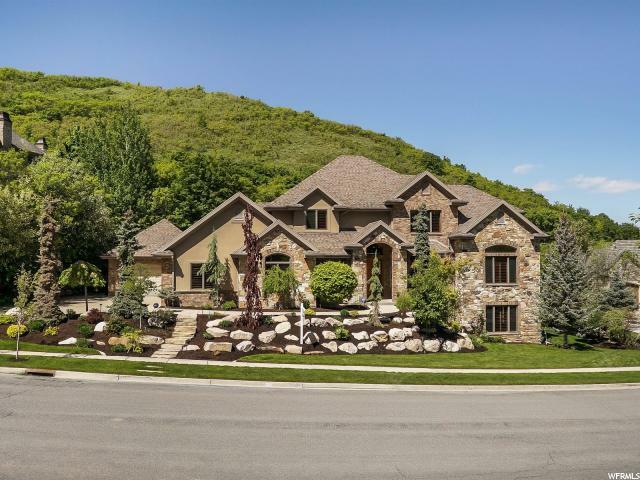 "Hidden in the breathtaking and majestic hills of Bountiful, 20 minutes to downtown SLC or the SLC International airport is this masterfully crafted one-of-a kind custom built estate, in the prestigious Maple Cove development. Panoramic views of lakes, mountains, and city lights from nearly every window! Quality built and personal residence of a well respected Commercial Builder. Professionally designed and decorated throughout. Accessed by a private lane surrounded by pine trees and scrub oak, this home is nestled on a flat portion on over 2.5 serene and private acres. With over 5 patios, 2 decks (1 heated), it is an entertainer's paradise. Two enormous great rooms with fireplaces, pool table and fusball areas, a stunning home theater, kids gaming area and home gym overlook the indoor basketball court. The open concept gourmet kitchen is a chef's delight with top of the line appliances, Subzero refrigerator, warming drawers, ice makers, double ovens, pot fillers, etc..etc.. Skylights throughout this home only enhance the oversized picturesque windows and sliding doors throughout. A women's office in the center of the home as well as an upstairs sewing/craft room could double as nanny quarters or a mother-in-law apartment. Main floor master suite with huge walk-in closet, Over 1900sq ft garage and workspace with walk-up storage on a 2nd level in the garage for all of your adventures. Truly a masterpiece!" "ABSOLUTELY STUNNING Mountain House to be built on 5 acres of Privacy with the most AMAZING VIEW in the entire valley. Pick your interior and exterior finishes. 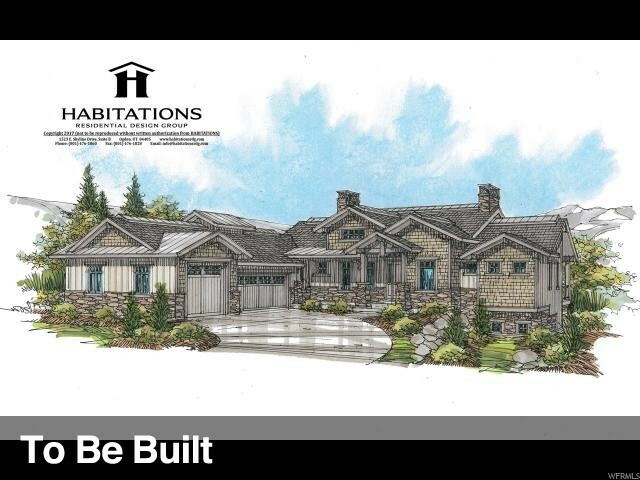 This home is designed as a Rambler with 3 MASTER SUITES and a 4th bedroom with the option for a 5th. Single Level Living at it's finest with the entire basement for your parent's to have they're own living space with SPECTACULAR VIEW ALSO! If more space is needed the plan can be altered to a Two Story easily." 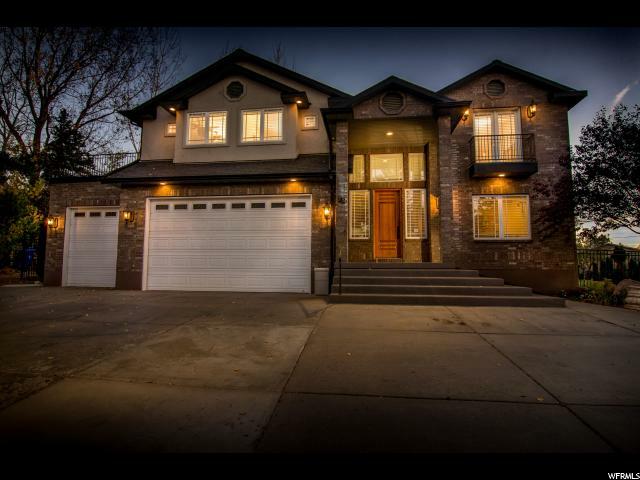 "This stunning home has 4600 SQUARE FEET ON MAIN FLOOR! 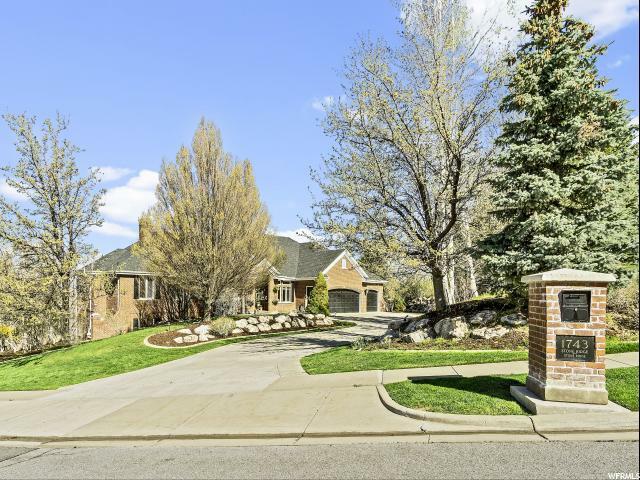 *15 minutes from downtown SLC* Fabulous great room with soaring double height vaulted ceiling and stone fireplace! Gorgeous wide plank, hardwood flooring and 24 tile. Gourmet kitchen with unique honed granite counter tops. Commercial grade Miele appliances, plus Blue Star range! Kitchen features a baking area and a large pantry. Stereo System and state of the art electronics throughout the house! The main floor media room could be used for many purposes (family room, 5th bedroom, or office). EXTREMELY PRIVATE BACKYARD with multiple outdoor entertaining areas, including a courtyard, large covered patio, and pergola with canvas awning. Stone wall with waterfall! Indoor Pentair automated salt water pool with jetted tub and current generator. Heated floors throughout the home including the pool deck, garage and driveway! Too many extras to list!" 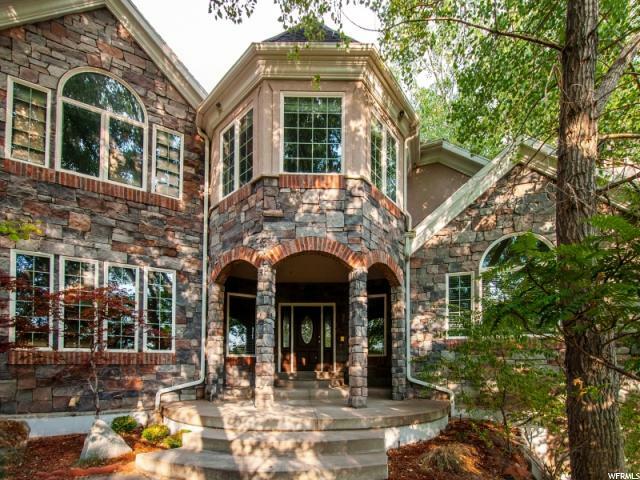 "Nestled in the coveted Stone Ridge neighborhood you will find this timeless custom home designed for large scale entertaining and loaded with upgrades and amenities at every turn. Your grand foyer boasts travertine flooring, custom mill work which you will find throughout the home and leads you directly to the main floor home office with custom built-ins and the gracious formal living room with sweeping valley & sunset views. Your gourmet kitchen was designed by the famous Mike Graham and offers double islands, Wolf & Subzero appliances, commercial grade gas cooktop and some of the most exceptionally crafted cabinets you could find in any price range. Your great room boasts a built-in entertainment center along with one of three gas fireplaces and direct access to your expansive covered deck. The main floor master retreat offers a separate sitting room, access to the covered deck, and a spa style bathroom with separate vanities, large jetted tub, steam shower and ample built-in storage cabinets. Your walk-out lower level features ten foot ceilings, ample natural light, a second full kitchen, second laundry room, and two large family rooms for entertaining in style. There is also the cutest library alcove you could ever hope to find with a day bed and built-in bookshelves. Your home theater features stadium seating and an included projector. There is also an exercise room complete with padded flooring. To keep you comfortable in every area of this home, there are 2 furnaces with separate thermostats, plus double water heaters, and a central vacuum system. 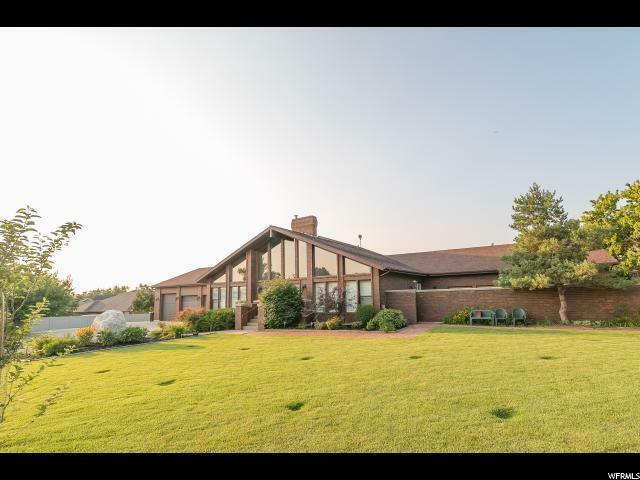 The home is situated on a .71 acre lot featuring mature trees, privacy & seclusion and a hard to find flat driveway. Your freshly mulched flower beds are filled with low maintenance perennials. There is a large storage room with a garage door to your backyard that can be used to store 4-wheelers or other toys or yard equipment. 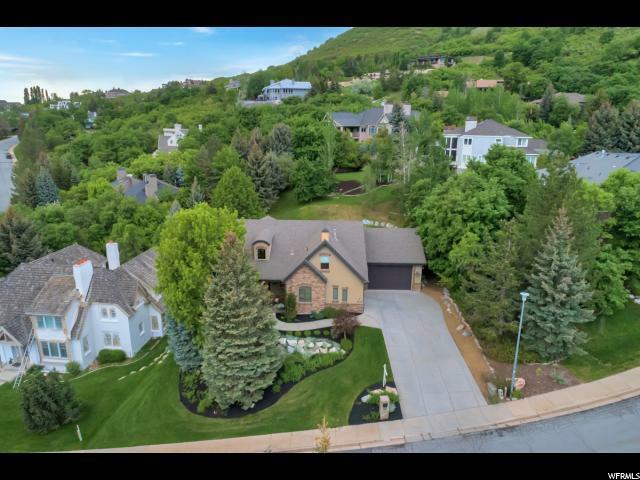 If you have been seeking a turn-key estate with some of the most amazing vie"
"Set high in the foothills of Bountiful, this extraordinary home and beautiful grounds will take your breath way. Unmatched craftsmanship and superb design are evident throughout. Warm and inviting, the entry and main family room perfectly frame a cascading waterfall through the large wall of windows, bringing in the beauty of the outdoors. Rich alder woodwork adorns every corner of the home from the gorgeous coffered ceilings all the way to the baseboards. The magnificent finishes add a touch of elegance to this majestic east bench home, including new paint and carpet throughout. An earth tone tile floor and natural brick accents highlight the custom knotty alder cabinetry in the open kitchen and dining area. This gathering space provides a quaint breakfast nook, also with views of the back waterfall and complimented by a gas fireplace and access to the back patio. Wrapped in comfort and expert craftsmanship, the grand suite adjacent to the front entry is dripping with charm. With beautiful tile throughout and rich granite, the bath provides jetted tub and plenty of closet space. Upstairs are two more bedrooms and an executive office suite with attached bath and cherry wood built-in bookshelves creating an air of achievement. In the basement are two additional bedrooms, a private home theater an impressive craft room and an adorable play-land built in under the staircase. The exterior features immaculate grounds rivaling the finest wedding or reception centers. With a heated cobblestone/brick driveway, three car garage, lush green lawns and colorful landscaping, the property is a welcome respite for relaxation. 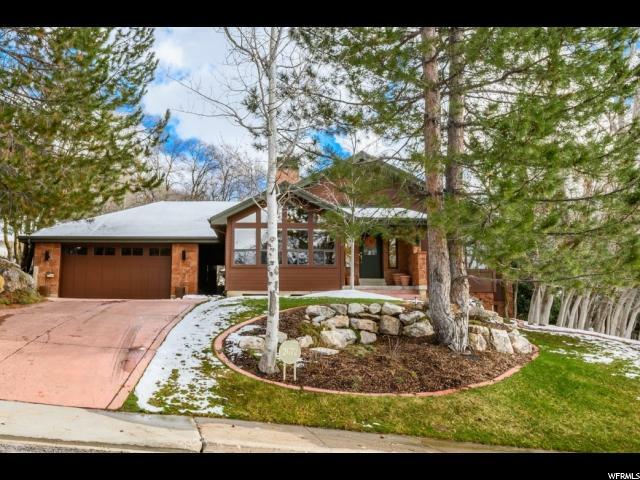 The home is located just below Bountiful Blvd in the shadows of the mountain and provides stunning views of the valley southward. Both adjacent lots on either side of the home can be purchased separately and include a basketball court and fully landscaped yard." 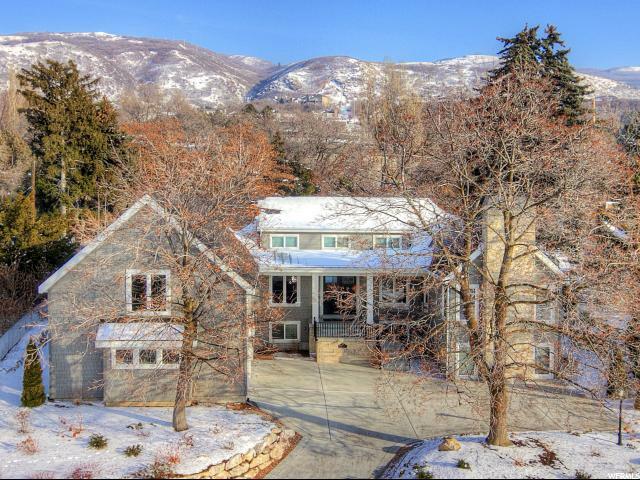 "Privacy and Views...Privacy and Views...Priva...Come and see this stunning, custom home in the hills of Bountiful today. Open floor plan that you will fall in love with. Updated and gorgeous kitchen that is every cooks dream that flows nicely into a huge great room with vaulted ceilings to keep the family togetherness. Formal dining room, private office, formal living room and huge laundry room round out the main floor. Downstairs you'll find a walkout basement with 10 ft ceilings, 3 bedrooms, 2 bathrooms, a theater room and plenty of storage space. Upstairs you have the incredible master suite, complete with walk-in closet, jetted tub and separate shower. Try out your green thumb in your own, fully equipped greenhouse. With over 6 acres, just go camping in your own backyard. So many features to list, I've attached more. Call me and let's set up your private showing today." 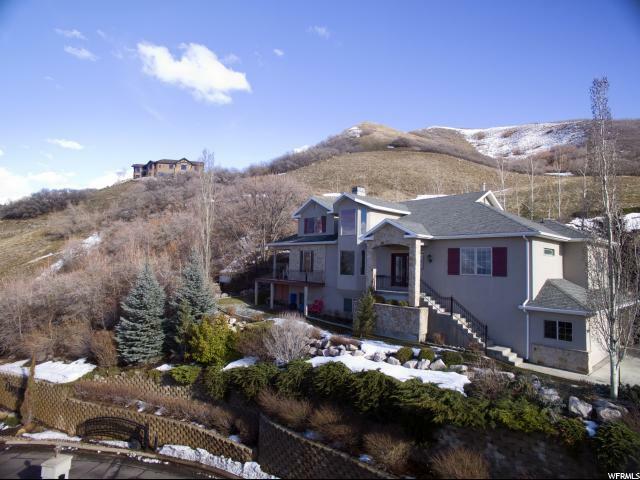 "Hidden in the breathtaking and majestic hills of Bountiful, less than mile to Mueller Park. This masterfully crafted one-of-a kind custom home was built to the latest load bearing codes for snow, 50 year shingles, high wind/hurricane and earthquake codes. Panoramic views of mountains, and city lights from nearly every oversized picturesque window! The open concept gourmet kitchen is a chef's delight with top of the line appliances, Subzero refrigerator, two dishwashers, warming drawers, ice makers, double ovens, pot fillers, butler's pantry and kitchen office. The main floor features a master bed and bath that could double as nanny quarters or a mother-in-law suite. The formal dining has coffered ceiling. The upstairs master bedroom has a steam shower, bidet, garden tub, oversized double vanity, huge walk in closet, washer & dryer and a hidden room. The house has 3 fireplaces, one on each floor, a stunning theater room, daylight basement with 2 walk outs, large family room, 3 bedrooms and 2 full baths and large laundry room. Basement is wired and plumbed for 2nd kitchen. Beautiful wood finishes throughout the entire house, floors are solid 8-inch hand scraped hickory, travertine, marble, tile and carpet. The backyard is flat great for a pool or tennis court, large trees, beautifully landscaped and large covered patio. " "Located in beautiful prestigious Summerwood Estates. Large, private, flat wooded lot. Newly excavated for buyers to have the opportunity to create their dream backyard! Envision your private pool, waterfall, sports pad, playground, and more. Spacious bright floor plan with soaring 19 ft. ceilings in great room that open into loft area. Main floor master suite, with adjoining separate room; great for extra office, nursery, studio, exercise room. Family room down with 2nd kitchen can close off for a full MIL apartment with separate entrance. Theater Room, 2nd laundry & generator. Large room under garage, great for cross-fit gym or workshop. An additional extra storage under large covered patio for storing landscaping items or pool equipment. Heated driveway & walks. Radiant heat in basement & main floor. A short 14 min. commute to downtown SLC & airport. **Be sure to view aerial video - find on tour button." "BREATHTAKING LUXURY home with FANTASTIC VIEWS, nestled on 3.67 acres! MINUTES from downtown Salt Lake City. This home is truly a DREAM home! Featuring gated entry you will enjoy extreme privacy in fabulous location, just minutes from downtown life. This is the PERFECT home for entertainment, including an INDOOR BASKETBALL/RACQUETBALL COURT & SAUNA! Featuring gorgeous vaulted ceilings, CUSTOM trim/molding, marble, over-sized walk-in closets and rooms, and beautiful, recently refinished, hardwood stairs! The MASTER BATH has been upgraded; showcasing custom marble flooring, new fixtures, custom cabinetry, and large walk in closet! The attention to detail is phenomenal! Venturing outside, peace and serenity awaits. It truly feels like a park with all the space, PRIVATE gazebo, and stream running throughout. Come check out this one-of-kind oasis! PLEASE VIEW AGENT REMARKS FOR SHOWING/OFFER INSTRUCTIONS." "RARE OPPORTUNITY! LIVE IN ONE UNIT AND LET TENANTS PAY YOUR MORTGAGE OR USE AS STRAIGHT INVESTMENT PROPERTY. THIS VERSATILE HOME HAS BEEN SUCCESSFULLY USED AS A PERSONAL RESIDENCE, LONG TERM, SHORT TERM, AND NIGHTLY RENTAL. 4 REFRIGERATORS INCLUDED OTHER FURNITURE AND APPLIANCES NEGOTIABLE. CAN USE RENTAL INCOME TO HELP QUALIFY FOR LOAN. 7% Cap Rate"
"Back on the Market!!! just in time for spring and Summer Entertaining with, Indoor Pool!!! Hot tub large private patio, gas BBQ. overlooking a wooden area. Beautiful View from the deck of the Master bedroom"
"This awesome home sits on a nearly half acre wooded view lot with large flat back yard area to enjoy this summer. You'll be welcomed by the spacious entry foyer and soaring ceilings in the great room and remodeled kitchen. Massive island bar with second large buffet island table make this home wonderful for entertaining large gatherings. Floor to ceiling fireplaces make great focal points to the rooms. His and hers offices on the main floor (could be 3 bedrooms on main). Kids room with two-story loft; great for hours of fun. The private master suite has double vaulted ceilings and a spacious sitting area. Remodeled master bath has large jetted tub separate shower, walk in closet with his and her sides. Downstairs is a open family room, kitchen, and sunken exercise area. Near the Mueller Park trails. Square footage figures are provided as a courtesy estimate only and were obtained from appraisal. Buyer is advised to obtain an independent measurement." "VIEWS, LOCATION, ONE LEVEL OPEN FLOOR PLAN LIVING, AND MUCH MORE found here in this Bountiful beauty! 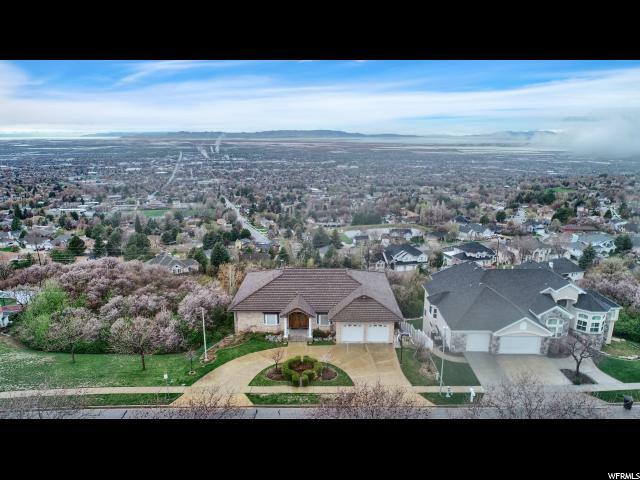 Whether you're looking for walking distance access to the Mueller Park area for hiking, the local golf courses, the Bountiful Temple just a few steps across the street, or the breathtaking views of the valley- you'll have all of those attractions to access at this home. From the moment that you walk in, you'll notice the stunning unobstructed east views of the valley. The main floor is nearly 2500 sq. ft. with the master suite and laundry all on that floor. You'll have access to the two basement levels (4593 sq. ft. total) by the main floor elevator or grand staircase. Each level has a massive family room area (3 total), two kitchens in this home, two laundry rooms and a walk out basement to the wooded private backyard. The basement even boasts it's own workshop area with access to the backyard. The owners built this custom home with countless detail throughout- high ceilings, large bedrooms, moulding details throughout the hallways to accent artwork on the walls, bar tile roof, east deck off of the master suite and kitchen, and coffered ceiling in the front office area. Call today for a showing- priced to sell (look at the low cost per sq. ft.!" "Absolutely gorgeous home with uniqueness, charm & elegance! An entertainers dream. Gourmet kitchen with commercial grade appliances, Subzero fridge/freezer, wolf gas range, warming tray & huge island. Main floor has nice open floor plan with family room, formal & semi formal dining, office, large laundry room & 3/4 bath. Upstairs boasts exquisite master suite with fireplace, 4 other large bedrooms, 3 full baths, laundry room & beautiful patio with gorgeous mountain & valley views. Finished basement with 2 large bedrooms, family room, full kitchen & theater room to die for! Walk out of the basement into a beautiful tree lined backyard with basketball stand, huge shed, fruit trees & large grass area. Guys will love the extra length garage with heater & hot/cold water, not to mention, plenty of room for large RV pad. Call today for private showing. *** Qualified buyers only... please allow 24-hour notice for showings. *** Please remove shoes before showing." "Amazing views!! Relax and enjoy sweeping vista of mountains and valley from 2 covered decks with auto sun shades, while listening to the Barton Creek as it flows through the backyard. No backyard neighbors: and the adjoining county-owned land next door has been available for owner's use! Home is located 1 block west of Bountiful Temple and Eggett Park. Master suite on main level, with 2 additional full bedroom suites! Vaulted ceilings, updated carpet, new paint, all new stainless steel kitchen appliances, wood plantation shutters, central vacuum system, new furnace, new AC and new water heaters! Huge rec room, large laundry room with tons of storage, oversized garage, and basement workshop. 3rd garage bay large enough to fit a boat! Hot tub negotiable. **Basement square footage listed is combined as there are 2 basement levels." "Gorgeous home located in the Historic Old Fort part of Bountiful. 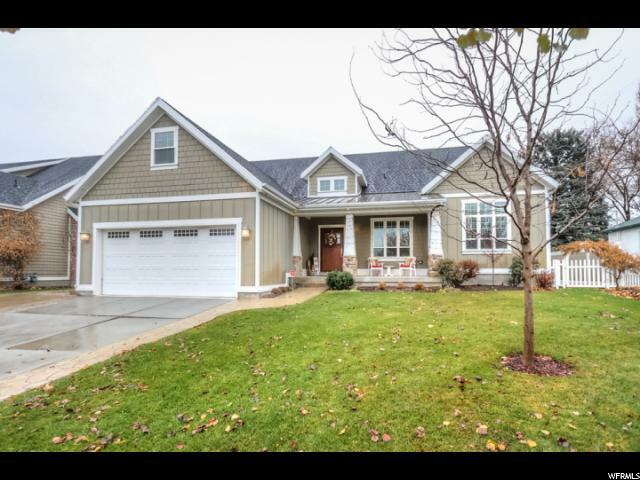 This home was custom built with real wood hardwood floors in the beautiful entryway and master bedroom along with soaring vaulted ceilings. The large kitchen features a Wolf 4-burner range and other kitchen appliances from KitchenAid and LG. The large island provides additional seating! The master bathroom has dual shower heads, a jetted tub, heated floor, and walk-in closet. In addition, the basement has especially tall 9-foot ceilings without any obstructions for air vents due to innovative floor joists. The Jr. guest suite features a bathroom and walk-in closet. The office/library includes built-in shelves and coffered ceiling. A spacious family room with wet bar is perfect for those movie nights with the home theater system. The home also has a built in audio and functional alarm system. The three-car garage on the north side of the property includes an especially tall third garage door designed for you to pull through with your camper or boat for winter storage. Come spring, you?ll be inspired by the mature flowering cherry tree directly outside your kitchen window and the custom landscaping while children play on the basketball court shaded from the hot afternoon sun by the garage. A mudroom and attached 1/2 bath stand is readily accessible from the side door, garage, and backdoor." "**OPEN HOUSE SATURDAY APRIL 20TH 3-5PM** This house has it all!! 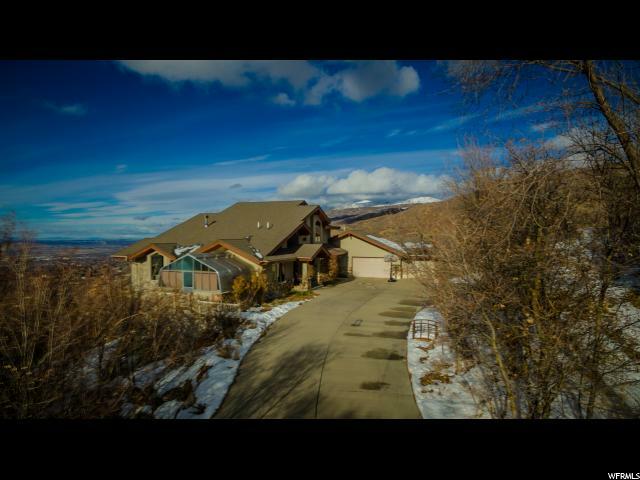 This is main level living at its finest in the heart of Bountiful with beautiful mountain views and easy freeway and business access all at the same time! This home has been lovingly cared for by the original owners and you'll love the personal touches, including the beautiful stonework and the kitchen that will make you love to cook. The basement could easily be converted to a mother-in-law apartment with a private entrance. At just under half an acre, this lot is amazing. The backyard is beautifully landscaped complete with a small stream! The garage can fit 4 cars and can easily be used as covered RV parking. Come see all these features for yourself by making an appt with Anne." "Views, Views, and MORE Views!! This open floor plan provides incredible views from almost every room in the house. Cherry hardwood, marble and travertine tile, vaulted ceilings, and a rock fireplace provide the base for this high end, well designed home. The open concept design encourages family members and guests to interact and enjoy this peaceful, secluded setting. Large master suite with steam shower and walk in closet, spacious bedrooms with attached, tiled bathrooms allow comfort and convenience with family members and guests. Extra large basement family room with attached mudroom and storage are a plus. Amenities include maintenance free landscaping, heated driveway, waterfall, central vac, wired for elevator, two laundry rooms, and wraparound porch to enjoy the beautiful views. Don't miss out on this one!" 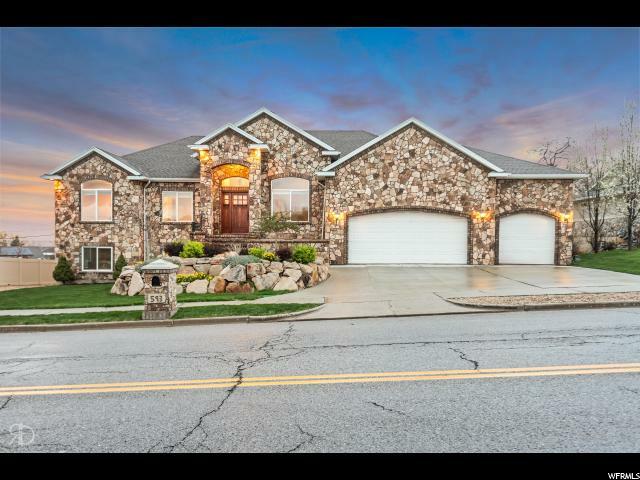 "A GEM** LOCATED CLOSE TO QUAINT DOWNTOWN BOUNTIFUL. THIS LOVELY CUSTOM HOME IS A JOY TO BEHOLD**SKYLIGHT IN ENTRY WITH AN OFFICE FULL OF NOOKS** THEN ENTER INTO A OPEN VAULTED GREAT ROOM WITH CUSTOM WOODWORK THROUGHOUT** UNIQUE FIREPLACE WITH REMOTE CONTROL THERMOSTAT**VIEW THE TASTEFUL KITCHEN WITH SPECIAL ONE OF A KIND GRANITE COUNTER TOPS, ELECTROLUX. APPLIANCES, TWO DISHWASHERS, PEAK AROUND THE CORNER TO A GREAT LAUNDRY ROOM AND OFFICE** AS YOU JOURNEY DOWN THE HALLWAY ON NATURAL WALNUT FLOORING NOTICE THE BEAUTIFUL WINDOWS THAT FILL THE WALL** AGAIN IN THE MASTER BEDROOM YOU WILL A SEE A BEAUTIFUL WALL OF WINDOWS WITH A DOOR THAT LEADS TO A PRIVATE COVERED PATIO** THE MASTER BATH HAS A LARGE JETTED TUB AND A VERY PRIVATE TWO HEADED SHOWER**THE MASTER CLOSET IS FABULOUS WITH CUSTOM BUILT IN AND PROFESSIONAL ORGANIZERS** THE BASEMENT HAS TWO BEDROOMS ONE FULL BATH AND A WORKOUT ROOM WITH A 3/4 BATH AND WATER FOUNTAIN, AN ADDITIONAL FAMILY ROOM WITH A LARGE UNFINISHED ROOM FOR A HOME THEATER. ETC. 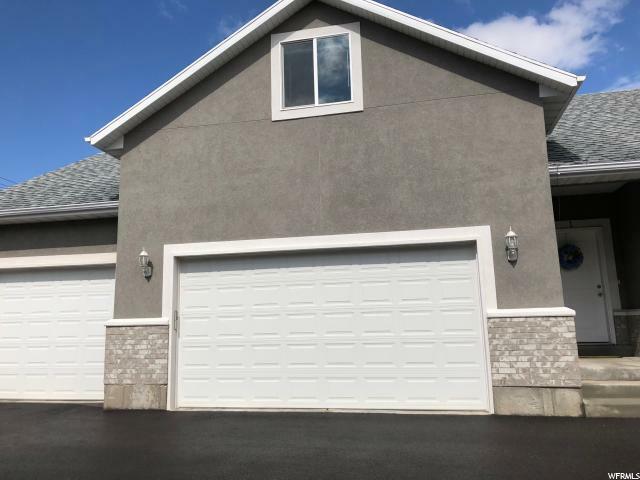 UPGRADES INCLUDE KOHLER FAUCETS AND SINKS, SOUND SYSTEM, BEAM VACUUM, UPGRADED WINDOW COVERINGS, WORKSHOP IN THE GARAGE AND TO TOP IT OFF PROFESSIONAL LANDSCAPING**"
"Beautiful fully finished 2 story home in an amazing location in the Heart of Bountiful. Home features all main level living with laundry and master on main. Upgraded finishes and lots of storage throughout. " 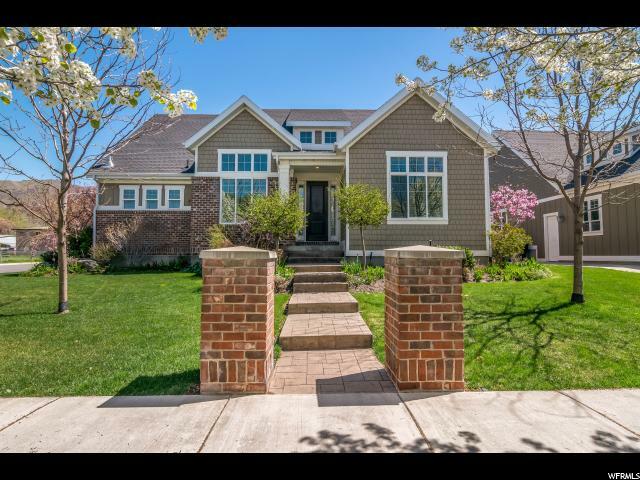 "Beautiful brick/stucco East Bountiful Rambler in coveted Lewis Park development. Model home feel:Immaculate care, new carpet, fresh paint, warm hardwood floors, new dishwasher, newer pergola, newer hot-tub, both electrical and gas hookups for dryer and range, tool room in garage, finished w/quality workmanship throughout. Professionally landscaped yard w/beautiful cobblestone patio/walkways. Gorgeous views! "